Click the "Tools" menu label at the top of the main window. The Tools menu provides commands for editing category, priority, location, and contact data. It also provides commands for viewing a list of recently displayed or sent reminders and for customizing the menus or keyboard shortcuts. Selecting this command will show the Category Editor, where you can add, delete, or modify the list of categories that can be associated with events, tasks, notes, and contacts. Category appearances can also be modified by using this command. Selecting this command will show the Priority Editor, where you can add, delete, or modify the list of priority types that can be associated with events and tasks. Priority appearances can also be modified by using this command. Selecting this command will show the Location Editor, where you can add, delete, or modify the list of locations that can be associated with events. Location appearances can also be modified by using this command. Selecting this command will show the Contact Editor, where information about your contacts can be viewed, modified, imported, or exported. 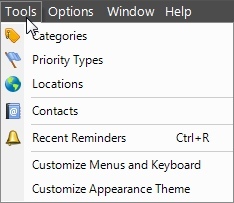 This will display the Recent Reminders window, where recently snoozed or dismissed reminders can be redisplayed. You can also resend previously sent email and text message reminders. The "Customize Menus and Keyboard" command will show a window enabling the menus, toolbars, and keyboard shortcuts to be modified. 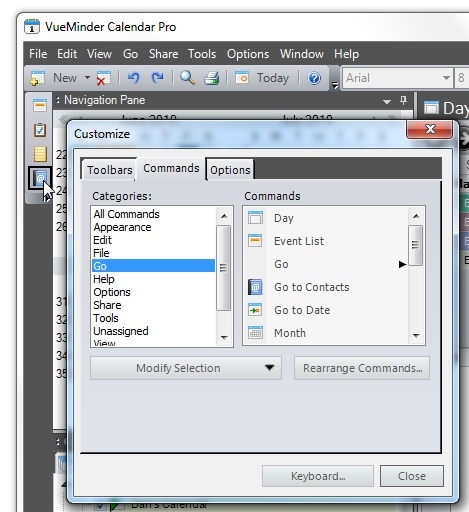 Commands can be added to the existing toolbars and menus by selecting the Command tab and then dragging a command from the list on the right into the desired toolbar or menu on the main VueMinder window. While the Customize window is displayed, you can also click and existing command on a toolbar and drag it to a new location, or drag it off the toolbar to remove it. 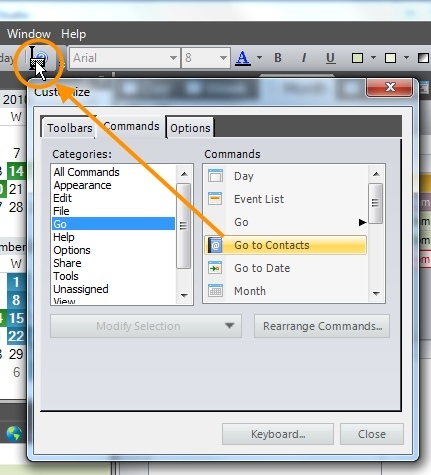 You can also right-click a command on a toolbar to access additional settings, or even edit the command's icon. A new (empty) toolbar can also be created, and commands dragged into it. 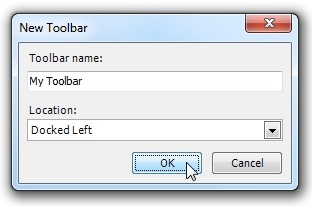 To create a new toolbar, click the "Add Toolbar" button on the Toolbars tab. If you find yourself frequently using the same command, and have a hard time remembering keyboard shortcuts, you can define your own toolbars to help improve your efficiency. In the example below, a new toolbar is added and docked along the left side of the main window. The toolbar will initially be empty, as you can see below. To add commands, drag them from the Customize window into the toolbar. In this example, the various List View data types are dragged to the new toolbar, for quick access. 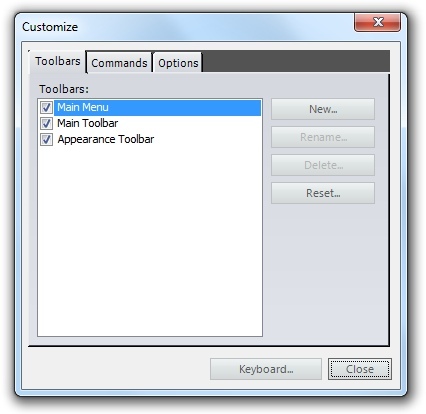 After the Customize window is closed, the new toolbar is ready to use. VueMinder has a number of default keyboard shortcuts. These can be customized, and additional shortcuts defined for any of the available menu commands. To do this, click the "Keyboard" button at the button of the Customize window. 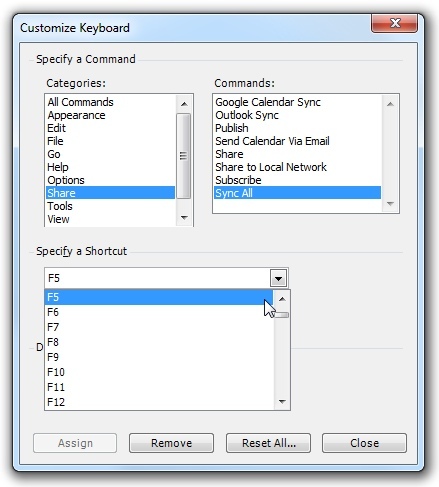 A "Customize Keyboard" window will then appear, as shown below. 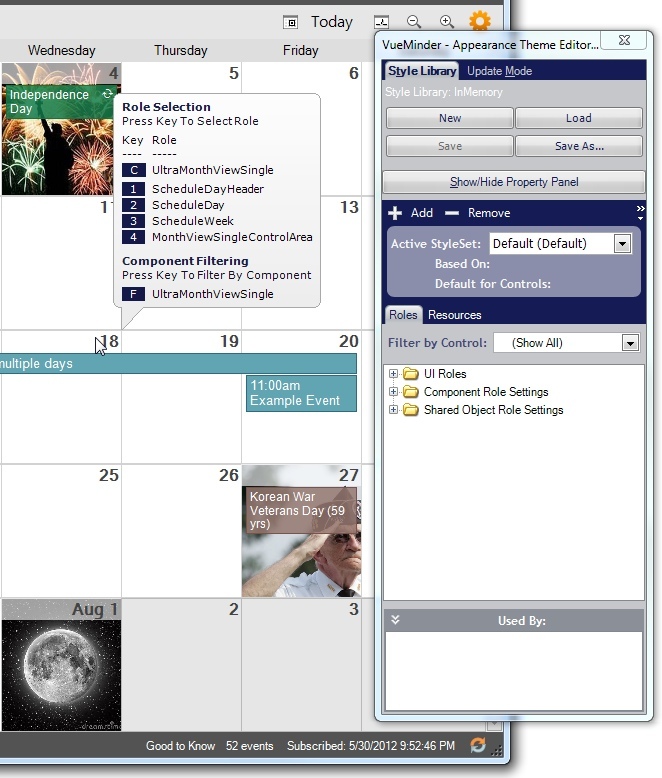 A list of command categories is shown at the top-left. The commands belonging to the selected category are shown at the top-right. Select a command to change its keyboard shortcut. The shortcut can be selected from a drop-down list. 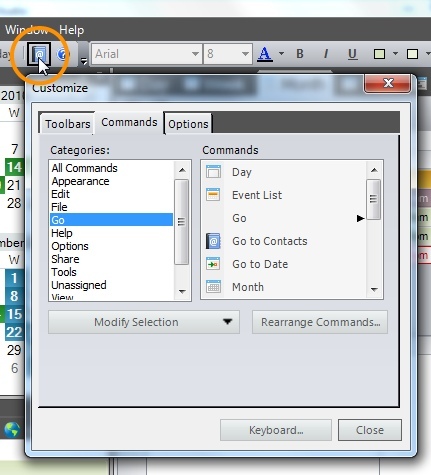 After selecting the desired shortcut, click the Assign button to assign the shortcut to the selected command. If there's a conflict with another command, the window will update to show which command is in conflict. You can remove a shortcut by clicking the Remove button. When finished, click the Close button. VueMinder provides a graphical editor for creating custom appearance theme files. This tool enables you to simply hover the mouse over any visual component (i.e., button, tab, etc.) of VueMinder. Press a number key to edit the display properties of the hovered component type, such as its color. You can even assign bitmaps to skin the various components of the window.